Start of 2017: A Taste of...Spring? Our meteorologists enjoy the simple things in life, like watching the snow fall before coming into work. Photograph by Meteorologist Mark Miller. The first month of the New Year is always a little bit exciting due to the prospect of a fresh start. While January was certainly active, it didn't hold as much snow as the lover of such may have wanted. Regardless, the month was flanked with two potent Nor'easters (one from January 7th-8th, the other January 23rd-25th). The first resulted in higher totals towards the southeastern portions of New England, who received up to 18" of snow with blizzard conditions. The second was an atypical Nor'easter this time of year, bringing more rain & wind than snow & ice. Regardless, interior portions of the Northeast still had to contend with mostly sleet and a bit of snow & freezing rain, while shorepoints were dealing with heavy rains, strong winds, & coastal flooding. Meanwhile, while a few wintry events did occur in February, much of the month was reminiscent of April, with multiple days of record-breaking warmth. There was even a 4 reports of tornadoes, the most notable one occurring just outside of Scranton & Wilkes-Barre, PA.
Snowfall during the January 7th snowstorm in Gloucester, VA; image courtesy of Meteorologist Andrew Barney. Two notable storms highlighted the first and second half of the month of January. The first, January 7th-8th, produced more snow across the coastal plains than their often colder & snowier brethen over the interior. Plymouth County, Massachusetts was the winner of this storm, with up to 18" reported due to 1-2"/per hour snowfall bands. In addition, blizzard conditions were also observed, as 30 - 40 mph wind gusts caused significant blowing & drifting of the snow pack. The second storm, January 23rd-25th, involved a potent nor'easter. While a nor'easter in January typically means widespread snowfall & sometimes blizzard conditions, it was more reminiscent of a March storm. Mainly sleet fell across the interior, mixed at times with snow and freezing rain, while heavy rain and high winds battered the shorelines. Moderate coastal flooding was had as well, resulting in significant beach erosion, particularly across the Jersey Shore. Finally, the end of the month was highlighted by a fan favorite - thundersnow! Yes, the afternoon & evening of January 29th featured snow squalls across the mid-Atlantic, one of which produced a few flashes of lightning over Burlington County, New Jersey. January actual and normal liquid precipitation & snowfall amounts for select locations across the Northeast & mid-Atlantic. Meanwhile, the highlight of February was the record-breaking warmth towards the second half of the month. On February 24th, many climate sites exceeded their typical daily high temperature by 20-30 degrees, some of which were record tying or breaking! As a result, much of the mid-Atlantic featured a "snow-drought", with not much in the way of wintry precipitation to be had. Even New England was relatively below average for the month. Instead, many chose to enjoy the outdoors and prepare for landscaping season as widespread 70s and even a few 80s were observed. Speaking of Spring, we had a decent severe weather outbreak on February 25th. A total of four tornadoes were reported from Massachusetts into Maryland. 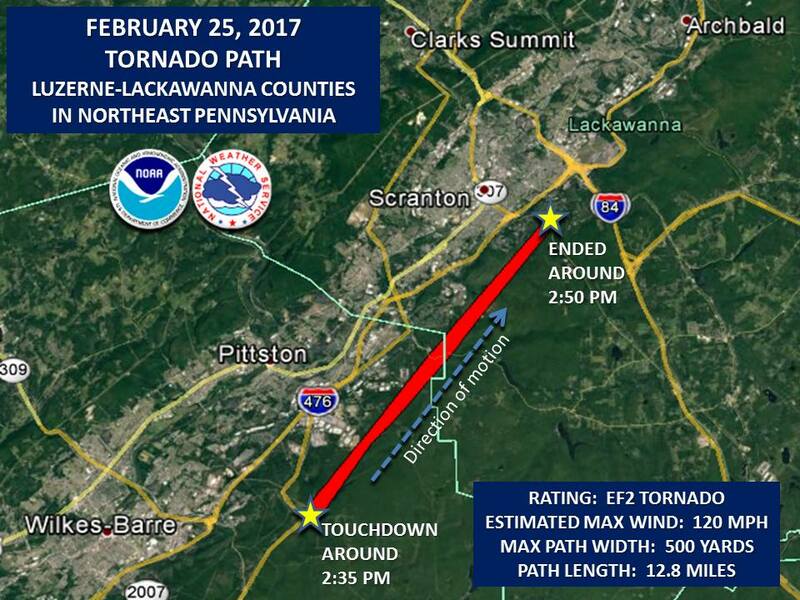 The most notable tornado occurred in Pittstown, PA (hometown of our very own meteorologist Sam DeAlba), and was rated an EF-2. Below is the survey from the National Weather Service in Binghamton, NY office regarding the path of said tornado. Luckily there were no injuries or fatalities, however it did lift a few roofs and down trees. The daily high temperatures for February 24th, 2017 at select location. Alongside it is the daily average high temperature, and the previous/current record high temperature.